In this lavishly illustrated and encyclopedic volume, architecture critic Hess contends that ""the Ranch House matches the philosophical potency of the bungalow, ... outstrips the brownstone in numbers, and ... challenges the log cabin in mythic power."" Hess, who has written several other volumes on 20th-century architecture (Googie, Rancho Deluxe, etc. 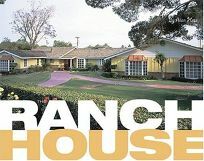 ), begins by tracing the history of ranch homes in the U.S.: from their inception on working cattle ranches during the 1800s to their peak in the 1950s, when thousands of ranch-style tract homes were sold for about $10,000 a piece. Along the way, Hess discusses the emergence of suburbia, the American obsession with the Wild West and the rise of new building technologies. The final two-thirds of the book contains photographic essays on notable Ranch homes, all in the American Southwest. Here page after page of glossy pictures proves Hess's earlier contention that ranch homes-which, he says, ""emerged from an amalgam of mid-century trends""-are one of the most adaptable residence styles around. Their sprawling, one-story layouts can accommodate many different decorating styles, from western to retro to colonial traditionalist. Among the most beautiful houses pictured is actor Robert Wagner's Los Angeles home, which was designed by Cliff May and vaguely resembles a Spanish hacienda. Though small problems with this book's design-namely, a font size that is at least one point size too small for comfortable reading-may deter some readers, architecture buffs, retro fans and coffee-table book collectors will see this book as a welcome addition. And for some, it may spark a love for a whole new area of design. Photos.